Historical records tell us that early humans were hunters and gatherers, living in environments where food sources were readily available. In the modern era, there are still groups of people who live as hunters and gatherers in parts of tropical Africa, in the Amazon rainforest and in select Asian jungles. Early people who lived outside of the regions of easily available food learned to cope with the challenge of assuring a secure food supply. Some people became herders of cattle, while others who lived in regions where water was readily available learned to cultivate food crops. Those who cultivated crops often had to cope with an uncertain supply of water, and responded by building places in which to store water. The early settlers who lived in rural Australia and rural southern Africa dug into the earth to build wells in which to store water. They learned how to minimize water loss from evaporation by covering the tops of their wells, and they planted fruit trees near the wells so as to make productive use of water lost to seepage. By comparison, state-built mega-dams with massive surface areas lose massive volumes of water to evaporation. Some five years ago in southern Australia, a massive state-built dam actually dried out during a prolonged and severe drought. The problem was compounded by state regulation that prohibited private water storage on private property. But a few farmers who still had functional wells on their property had enough water to endure most of the drought. This Australian regulation illustrates how government policy can actually inflict harm on private citizens. Private initiative in many countries now encourages people to invest in rain barrels in which to collect rainwater that flows off the roofs of their homes. Rain barrels allow property owners who live on small properties even in cities to collect and store water. While some property owners may store their rain barrels above ground, other property owners choose to dig a hole and keep their rain barrels below ground. The combination of private water storage on private property and underground water distribution allows private people to collect water during rainy seasons and grow vegetables and fruit during hot, dry weather. Many of the crops grown involve vertical agriculture like vines to increase production from small plots of land. Part of the initiative to grow food in cities results from governments being involved with politically well-connected companies that specialize in genetically modified (GMO) crops. Critics of GMO crops have voiced concerns reduced nutritional values and mineral content of such crops that are mainly used to feed livestock. The GMO crop industry, related pharmaceutical companies that produce antibiotics and growth hormones, and the mega-farm livestock industry are well connected to governments in many countries. Concerned consumers in developing nations have become distrustful of such alliances between government and industry and the products they supply to supermarket shelves. Citizens in the industrialized world have also become distrustful of that alliance and also seek to grow their own fruits and vegetables on small plots of land in cities using rain barrels to collect rainwater for their crops. The choice to use rainwater may be wise as most municipalities across North America add fluoride compounds to their drinking water, allegedly to benefit the dental health of children. But some argue that fluoride actually erodes teeth, and that it accumulates in vegetables and fruit grown on plants and trees that receive municipal water. Private citizens’ groups in major cities across India and South Africa are among the leaders encouraging private citizens who have plots of land or access to such plots to grow vegetables and fruits by their own initiative and to trade the products of their efforts. Owners of commercial buildings capable of carrying the weight of rooftop gardens have begun to rent rooftops in cities in both the developing and industrialized worlds. 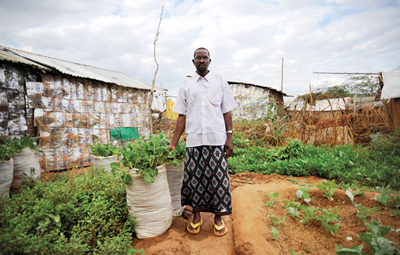 In cities in the developing world, growing one’s own vegetables is regarded as a form of economic empowerment, helping people to look after themselves. While elected officials in cities across the developing world allow for such private initiatives, officials in some cities in the industrialized world have responded very differently. There are now records of municipal bylaw officers in some American cities having actually visited the homes of citizens who grow vegetables in their gardens and given them a fine for the crime of “growing too many vegetables.” American domestic security guidelines now identify people who look after themselves by growing their own vegetables or producing their own electrical power as potential terrorists. Urban farms grow a range of produce often using vertical agriculture on small plots of land. Commercial farms specialize in one type of produce, mono-crop agriculture spread horizontally across a vast expanse of land. Critics of mono-cropping charge that such crops often require massive amounts of inorganic fertilizers that can lead to soil depletion as well as massive amounts of inorganic insecticides to protect against pests, often a single insect variety. Proponents of multi-crop agriculture counter that some plants add nutrients to the soil that other plants need, thereby minimizing or even avoiding soil depletion. The produce from urban farms is finding its way into urban markets in many cities around the world. That produce sometimes commands a higher price than produce grown on mono-crop mega-farms. In other cases, the cost is competitive and the result of reduced transportation costs between grower and market. Most urban farms are the result of private people taking the initiative to use private capital to do something constructive. The absence of state intrusion in the form of regulation aimed at protecting the commercial interests of mega-farms would assure a level playing field for small-plot urban farming to sink or swim on its own merits.